Like brain surgeons and the bomb squad, boxers don’t get to have bad days. But on Saturday in Chicago, in his semifinal matchup of the current cruiserweight World Boxing Super Series, there stood former world titlist Mairis Briedis, quite obviously getting his wires crossed and freezing up while the patient bled out on the table. Only 10 months before, the 33-year-old Latvian had gone life-and-death with Oleksandr Usyk –- boxing’s answer to Vlad the Impaler –- and very nearly slayed the slayer. This was just Usyk’s 14th professional fight, but the number was inconsequential for a 31-year-old three-time Olympic gold medalist who had already snatched a world belt from Krzysztof Glowacki and, in his previous fight, stopped former cruiserweight kingpin Marco Huck. Usyk had already achieved world level and, in the ultimate barometer of pugilistic greatness, was now showing up in internet pound-for-pound conversations. So although Briedis entered the Usyk fight as a world titlist, and would draw strength from the setting –- Latvia’s capital city and Briedis’ hometown of Riga –- he was a grand champion playing his first match of four-dimensional chess. And he was up to the task. Briedis traded with Usyk, balancing patience and aggression, changing levels, often landing sharply and slipping much of what he found coming back. “Vlad” won the day, but Briedis was left anything but skewered. Usyk was awarded the slimmest of majority decisions, though it was clear his opponent had done as much, and perhaps a smidge more, to win. If Briedis wasn’t exactly hailed a conquering hero, he was viewed in defeat as a fearsome and aggrieved threat to any and every fighter in the 200-pound division. Contrast that scene to Saturday’s at the UIC Pavilion, where in the main event Briedis (25-1, 18 KOs) mostly puzzled over and pawed at Germany’s Noel Mikaelian (23-2, 10 KOs) for 12 rounds. Mikaelian stepped into the ring with decent length and an idea or two, but he hadn’t stopped an opponent in three and a half years, and he didn’t appear especially game until Briedis had convinced him that, on this night, he would be idling on the Autobahn, thank you very much. Briedis never committed to his offense, and he showed an odd indifference to so much as counter the light-hitting Mikaelian, whose confidence swelled –- and whose efforts to land between and around Briedis’ guard intensified – through the middle rounds. Any random glimmer of an exchange was quickly snuffed by the fighters’ clutching, rabbit-punching and wrasslin’ (the latter two costing Mikaelian and Briedis, respectively, a point). The result was an uncomfortable, unsightly, difficult-to-score fight. The judges reached consensus in just three of 12 rounds, but even in light of those circumstances Benjamin Rendon’s rendering –- he awarded Briedis the final five rounds -– felt off. Maybe the weight of expectations for Briedis, in the minds of some observers (*raises hand*), wound up as a thumb on the scales for Mikaelian. In any case, the 116-110, 115-111, 114-112 decision for Briedis was wildly unsatisfying for all. That included the Latvian himself, who declared sheepishly after the fight that he felt he’d done “50 percent of my job” against Mikaelian. 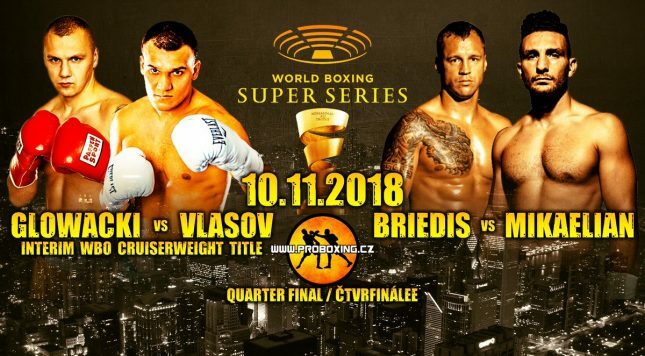 Whatever the precise figure required, a half-assed effort won’t cut it against Briedis’ next opponent, Krzysztof Glowacki, when they meet in the WBSS semifinals. Briedis was there to meet Glowacki (31-1, 19 KOs) in the ring after watching the 32-year-old Pole outmuscle Russia’s Maksim Vlasov (42-3, 25 KOs) for a unanimous decision in Saturday’s final bout. Whatever drama the moment held felt drummed up, if only because Briedis had set such a low bar for Glowacki and Vlasov -– and the two men managed only to just shuffle over it. They at least made the effort, as Glowacki’s full-torque, arcing punches were answered by Vlasov’s stabbing jabs and straight right hands for much of the fight. At one point, late in the third, Glowacki threw a curling counter left hand that seemed to tangle up Vlasov more than hurt him, but the Russian nevertheless finished the sequence on his seat. The knockdown was so unimpressive as to go ignored on one scorecard. Glowacki’s earnest body-punching and charge-forward style likely earned him favor with the judges, and Vlasov’s inability to put Glowacki in anything resembling danger over 12 rounds gave an air of inevitability to the 118-110, 117-110, 115-112 decision. The winner did what he was supposed to –- but not an iota more. Still, Glowacki, a snub for the inaugural WBSS, is just the sort of fighter who could mark trouble for Briedis –- the version of Briedis who showed up on Saturday, anyway. Glowacki has been solidly ensconced among the cruiserweight top five since toppling division fixtures Huck and Steve Cunningham a couple years back -– remaining so even after his lone defeat, a casualty of Usyk’s Clear Out the Cruisers World Tour. Despite showing pedestrian one-punch power, Glowacki is a step-forward slugger whose relentlessness and bull-headed durability would give him a chance to smother and outpoint a lethargic Breidis. So occasionally the detonator doesn’t go off. Briedis got away with one Saturday. But when he faces Glowacki sometime early next year -– assuming he’s still the same fighter at 34 that we saw during his war with Usyk -– he’d be wise to have all his tools at the ready.